Ready for Christmas? Little origami animals are great stocking stuffers. You can put a bunch of them in a small origami box to protect them while they wait for the kids to discover them. 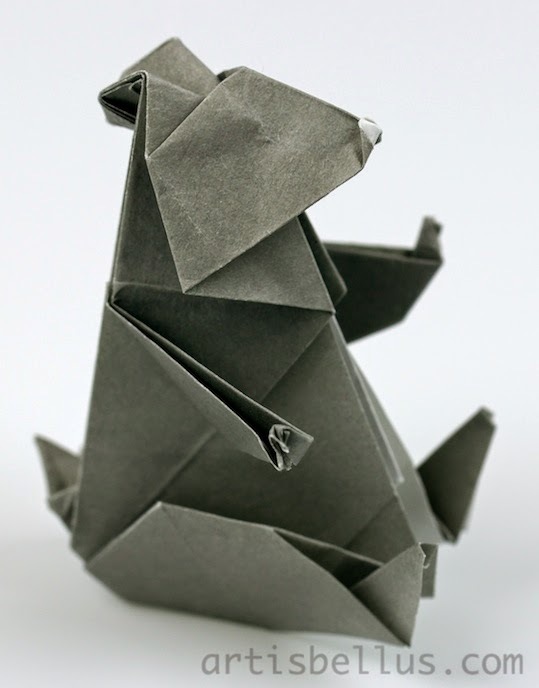 So here is one cute bear, designed by Tomoko Fuse, which is simple enough to be folded with small paper. The instructions can be found in the book Origami seasons , by Tomoko Fuse. I folded the bear with a 6" (150 mm) square of regular origami paper. 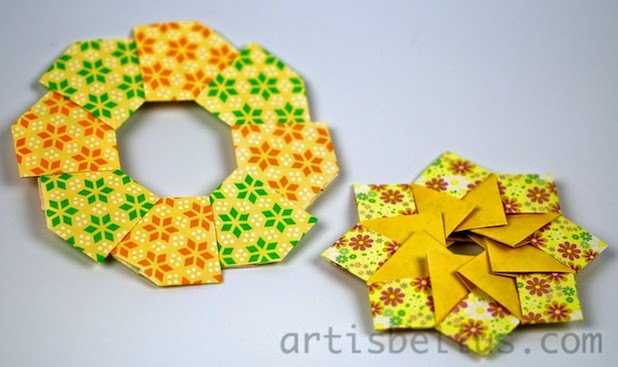 Origami Rings and wreaths are perfect decorations for the Holiday Season. Here are some beautiful ones, designed by Tomoko Fuse. The instructions can be found in the book Origami Rings & Wreaths , by Tomoko Fuse, which is my favorite book of modular origami rings. Each ring was assembled with eight modules, folded from 3" (75 mm) squares of kami (regular origami paper). Door wreath: 12" (300 mm) squares; scrapbook paper (or any paper thicker that kami). It will need a water resistant coating if hung outdoors. Paper jewelry (earring, pendant, bracelet charm): 2" (50 mm) squares or smaller; thin washi, double tissue (the smaller the squares, the thinner the paper needs to be). They will need a water resistant coating if you want them to last.